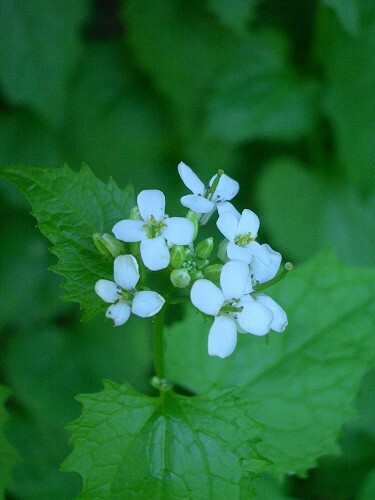 Garlic Mustard, sometimes known as Jack-by-the-Hedge, is a common perennial. 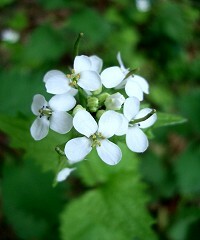 It is often found in hedgerows and likes damp woodland. The flowers are tiny clusters of white florets (about 6 mm across), each with four rounded petals. The leaves are heart-shaped and smell of garlic when crushed. 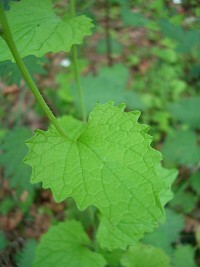 This plant is edible and used to be used in cooking to flavour fish and meat. It is also used in herbal medicine to treat gangrene, ulcers and sore throats.